I'm Hungry, A Monologue Not About Squirrels; by Gemini Kaimann IV, part of Healing Voices OnStage: Caregivers' Stories. Tickets are free! Call the George Street Playhouse Box Office at 732-246-7717. We're hoping for a large contingent from the New Jersey Volunteer Chapter to come out and support Julian and Gemini! Highly-trained Canine Companions for Independence assistance dogs are taught over 40 professional commands that are useful to a person with disabilities. Becoming a playwright isn't one of them. But nonetheless, the 3-year old black Lab/golden cross (in partnership with her literary executor) has been selected to debut her first-person story as part the NJ Theater Alliance Healing Voices: Caregivers' Stories performed March 26 at the famous George Street Playhouse in New Brunswick, NJ. In 2016, Gemini was matched with 12-year old Julian Senick Kaiman, a sixth grader at Highland Park Middle School. 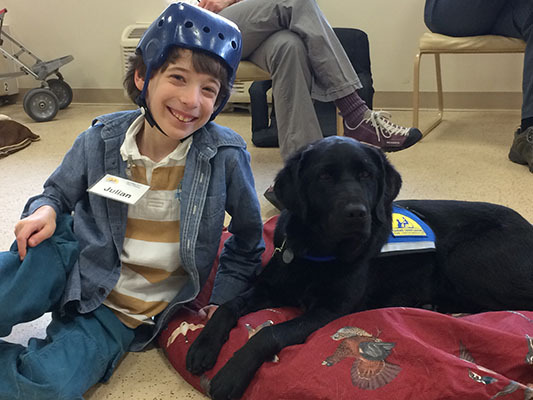 Julian's mom Jennifer Senick says her son's assistance dog has made a remarkable difference for their family, "Gemini gives my son greater confidence, responsibility, motivation and help in his everyday life. She picks things up for him, opens doors and drawers, carries his backpack to the school bus, puts his laundry away and retrieves his shoes. We knew Gemini was an expertly-trained dog that responds to more than 50 commands. We had no idea she had literary aspirations." Julian's Dad, Fred, serves as Gemini's literary executor, represented the dog at the Healing Voices writers workshop, "Because Gemini is a service dog she has public access so she has accompanied my son to many movies, concerts, lectures and plays. Who knew she was paying such close attention? Like all dogs Gemini has great vision and hearing but I didn't fully appreciate her critical observations of my family or her keen ear for dialogue. We're incredibly grateful to Canine Companions for Gemini so we're excited to see Gemini's play on stage in order to spread the word about service dogs and the good they provide. Like all Canine Companions recipients, we got Gemini for free. We are always looking for ways to pay it forward. It's a big responsibility knowing that you're picking up poop from the only dog in Canine Companion's 40-year history to write a play. It gives you a lot to think about." 12-year old Julian weighs in on his talented partner, "It's the best play ever because it's by my dog. Gemini is a nice and loving dog, but I never knew she was capable of this, and while I don't agree with everything she says about me in the play, it's her own opinion and she should be free to express herself." Healing Voices: Caregivers' Stories is a program of the New Jersey Theater Alliance which, each year, invites professional and family caregivers and patients receiving care to submit creative prose, poetry, and theatrical monologues reflecting the theme of caregiving or the personal healing experience. Selected playwrights then attend workshops to further develop their pieces. The Healing Voices program, now in its fourth year, is made possible through a grant from Mid Atlantic Arts Foundation with support from the National Endowment for the Arts. For information on Mid Atlantic Arts Foundation, please visit www.midatlanticarts.org.